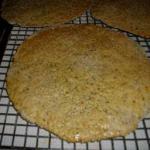 Try this Armenian cracker bread recipe, or contribute your own. "sesame" and "breads" are two of the tags cooks chose for Armenian cracker bread. 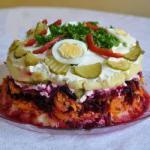 Layer Cooked Vegetables Interleaved Mayonnaise - Supposedly Salad, but Looks like Cake. I Recommend to Try! "warm Lentils Served with Cool Yoghurt and the Spice of Green Onions Makes This Dish a Refreshing and Filling Side Dish or Entree." A Wonderful Grilled/bbqd Treat as Well! So Delicious. From a Dear Armenian Friend. I Have Made This for 25 Years. It is so Easy and Always Comes Out Perfect. This to Me is the True Pilaf. This is a Flavorful Marinade That I Have Used Mostly with Beef Recipes for the Grill. Cooking Time = Marinating Time And is Approximate. From: The Bean Cookbook by Norma S. Upson. From The Soup Peddlers Slow And Difficult Soups by David Ansel.